Andrew Gelman and his co-authors build on results from a recent paper to draw some fascinating maps of what the 2004 presidential elections would have looked like if only (1) poor, (2) middle income, or (3) rich people had been able to vote. These maps show some obvious class differences (as well as illustrating the importance of poor voters to Democratic electoral prospects), but also suggest (as does the paper) some interesting relationships between how people at different income levels vote in rich and poor states. For poor voters, there is no systematic difference between rich and poor states. But for middle-income and especially for rich voters, there is a very strong pattern of rich states supporting the Democrats and poor states supporting the Republicans. 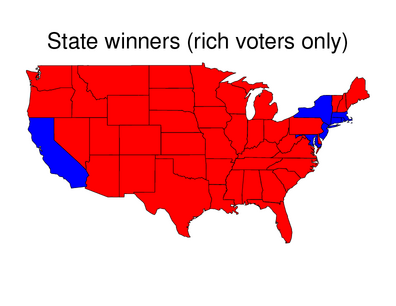 In short, rich people and poor people who live in poor states have very different voting preferences from each other. 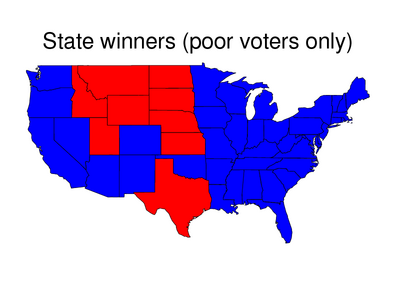 Rich people and poor people who live in rich states have much more similar voting preferences. Gelman et al. don’t have any hard and fast explanation for this (they note that race explains about half of this disparity, but only half). However, their results do suggest that some of the conventional wisdom of American journalists on class, voting and geographic location stands in sore need of revisiting. Very striking. I hope a lot of people see this. These maps suggest a clear strategy for democrats; Make more poor people. Dave; Oddly enough this is current GOP strategy. I wonder if they’ve thought it all the way through? I heard Tom Schaller speak last night, and he was making a similar point about the white and black vote in the South. Blacks voted in roughly the same proportion for Democrats wherever they lived, but for whites the percentage voting for Democrats in a state (or a county, I believe) was inversely correlated with the percentage of blacks living there. The result was that the more blacks there were, the more Republican the area was. I haven’t read the paper, but I’d imagine that the explanation is that the poor in poor states are people working in menial jobs, while in the rich states, the poor include a much higher proportion of educated people in the arts, publishing, non-profits, even start-ups. Ogged, it’s the middle-income people and especially the rich people whose voting behavior changes so much between rich and poor states, not the poor. Okay, but it looks like that’s still because it’s the rich people who are different, not the poor people. Poor people are voting more or less the same whether they’re in rich or poor states, but in the rich states the rich people’s voting pattern moves closer to the poor people’s. poor people vote blue in practically all the states. in poor (ignorant, backward) states, the rich bastards pull up the ladder behind them and vote red. in rich (liberal, enlightened) states, the rich have a conscience and vote blue. in ct, noblesse oblige, so you look out for the whole society and vote blue. in tx, i’m alright jack and screw you, so you vote red. and the causation may run the other way as well: states in which the wealthy have a social conscience get richer, because investments in social capital pay off. states in which the wealthy have no social conscience get poorer. Maybe the causality runs the other way round. The northeast and west coast states are rich because they have enlightened elites who support immigration, public education, high wages, environmental protections and other policies that lead to economic growth. The southern and plains states are poor because their elites are dominated by (a) gun-crazed anti-science racist bible-thumpers and (b) small business owners who only care about keeping taxes and wages low. In other words, Republicans. Oops, outdrawn by the Kid. but at least I said it more provocatively. Or being poor in the red states looks like such an awful calamity (because social services are already so non-existant) that the middle-class and rich simply cannot identify with such misery? The maps would have been even more interesting with Electoral College tallies right next to them. poor people have similar crappy jobs regardless of the state, but the rich in poor places are mostly in construction, real estate and other occupations that do not require broad horizons, while in rich states they would be working in high technology companies, entertainment, foreign trade etc. For voters who are disadvantaged–by income or by race–bread-and-butter issues trump “values.” So religious, socially conservative black Americans vote overwhelmingly Democratic. Voters who are socially and economically advantaged don’t find these issues pressing and so are more likely to vote their “values.” Rich folks in Red states are on the whole more religious and more socially conservative than coastal elites so, voting their “values” they’re more inclined to go Republican. Rich folks in those heavily urban deep Blue states are less religious and for the most part so averse to the conservative social agenda that their aversion to Red “values” trumps their economic interests. That seems to be a decent explanation in the abstract and I have plenty of anecdotal evidence from here in Blue California where quite a number of Democratic voters I know have no interest in the liberal agenda on economic issues and would vote Libertarian if it were feasible, but consider themselves liberal because of their commitment to environmental issues, gay rights, abortion rights and the like. There’s also the fact that so many people in California and New York, especially, are here from somewhere else. So even if they come from wealthy families, it’s not the same kind of quasi-feudal, rooted-to-the-place, family-oriented wealth that I surmise many rich people in poor states have. The latter states, which don’t get as many newcomers, probably fosters a more static consciousness where there are a few rich families (and everyone knows who they are), who have been rich for some time, and then poor families who have always been poor since way back when. And it’s hard for a poor person to move up because, even if he gets an education and skills, everyone knows he’s from Family X who are nogoodnik trailer trash. People come to California, New York, etc. for a fresh start and to escape that kind of thinking, so there is more social mobility and more social conscience. The more fundamental point, tho, is that the opposite signs of individual-level and state-level relationships between income and politics is an empirical fact. Whereas the reason for this divergence is specualtive, and simply can’t be resolved statistically, given that the number of plausible explanatory variables substantially exceeds the number of data points. As so often, we forget Montainge’s warning about the relative importance of “is it true?” and “why is it true?” at our peril. Poor educated people are mostly kids, and one might expect them to be distributed uniformly, except to the extent that educational opportunities differ between states, or that some kids just don’t stay put. My first thought on looking at the map of rich liberals was: Catholics. On second thought, it’s also Jews. Really, it’s just the most concentrated populations, expensive places to live, only high achievers may apply, elite enclaves with a continuous infusion of emigrants, internal and external. It’s a map of the parts of the country where we create and test the successive beta versions of the future of the rest. 14: Worked in a lot of Latin America: indeed, the first thing I thought of was that the “poor states” operate like third-world oligarchies. Omaha than it is in Boston. So, you could try to translate to a standard of living metric (or do some sort of income normalization) rather than using income alone, and see if part of the voting-income correlation difference is explained. what the 2004 presidential elections would have looked like if only (1) poor, (2) middle income, or (3) rich people had been able to vote. 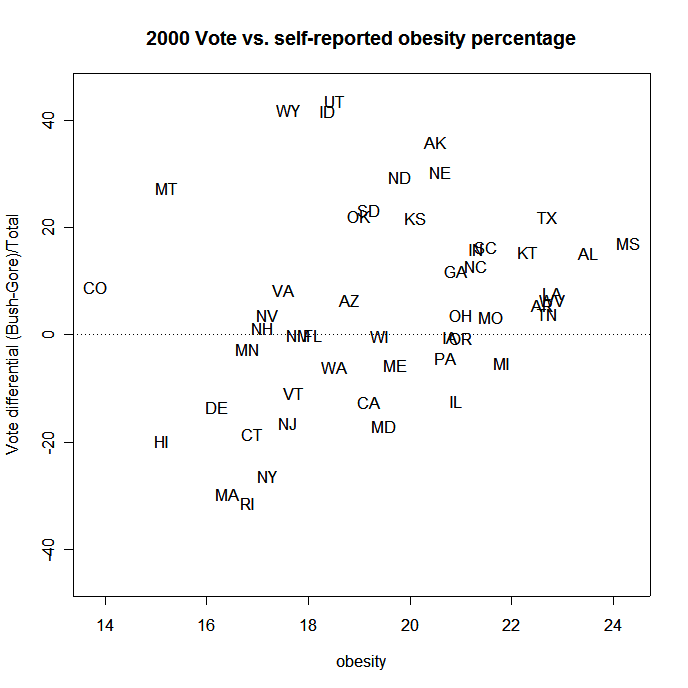 Interesting, yes; but what might have happened had only skinny people been allowed to vote? This appears to show that the President has broad-based support. Reverse causality; the South was conservative before it was poor, and now it’s less poor and it’s still conservative. Could be explained by confirmation bias; hey, we got even crazier and we got rich, so crazy is the way to go! Of course, the emotional costs of ideology imply that the fact that they were crazy and got poor before that are inadmissible. Hence the Republican strategy. Kill the middle class and deny the poor the right to vote. here is another take. I guess a bunch of poor voted in Harry Reid in Nevada. nice. another take, the middle is pretty red isnt it? very nice. When did Hawaii and Alaska get kicked out of the union? I think there’s a more striking lesson from this map: namely middle class voters. While middle class voters sort of mirror the 2004 results, they trend red in battleground states like Wisconsin, Oregon and New Hampster. This is why the GOP must kill SCHIP. If the Democrats win over the middle class again, like they did under FDR, then the GOP is in the Wilderness for a long time. If you did the map white people only it would look pretty red. Based on the 2004 results NY, CA, NJ and other blue states would have been red. in fact bush increased his white share. All Blue, if only Stanford and Harvard grads voted. Whenever a Republican posits that only those with an minimum economic interest in the country should vote, I retort with allowing only Stanford and Harvard grads to vote. He shuts up immediately. Hmm. The poor in Kansas do seem to have voted Republican after-all. So, what’s the matter with what’s the matter with what’s the matter with Kansas? Why are two states missing? Yeah, I’ve been hearing that one almost my whole life. It’s not true! More small & medium sized business owners are realizing that the repugs are only pro-business when it’s a big business. doug t, i was thinking the same thing. Need a relative income metric rather than an absolute one. Paul Krugman has discussed this paper, and another one, at his blog. Bassically, the picture of the gun-toting, misogynistic, racist, white thrash, trailer-park redneck as the archtypical Republican in the south is false. Be interesting to overlay those maps with GSP and export earnings maps for the lower 48. These maps have really been nagging at me, I have another theory. People in the northeast, greater New York, Boston, DC, Philly, Baltimore, have seen the effect that government can have on society; in the recovery of those urban centers during the 90s from the blight of the 80s. Also in NE, the rich come into contact with poverty in their urban areas, and they vote to fight it since it affects their lives. These people are willing to pay higher taxes since they have a noticeable effect, i.e. reducing crime and vagrancy. It’s not so much noblesse oblige as actual self interest. In less densely populated states the rich are more isolated from the poor and have had less effective governance so they don’t see point in investing in it. Oil barons aren’t accosted by panhandlers in Dallas, but hedge fund managers driving through the Bronx have to explain what a crack-head is to their kids. I think keupo has it — it’s urbanization. Poor states are less urban, and one thing cities create is physical proximity between the rich and the poor. On an elevated spiritual level, that promotes compassion in the rich. On a primitively self-interested level, the hedge-fund manager who takes the subway to work wants, e.g., services for the mentally ill so that they aren’t abandoned to harass him during his morning commute. If this is right, it would be testable — I’m guessing that ‘rich’ and ‘urbanized’ correlate pretty tightly, but it should be possible to tease them apart enough to see whether we’re talking about rich people in rich states, or rich people in urban areas. #48 makes an excellent point. Also, it is much easier to delude yourself into thinking that you are 100% self-reliant in the middle states. You can have such a huge exurban home with its own mini-orchard, swimming pool, etc, etc, that you can easily begin to think that you are a self-contained unit. In big cities, you realize that government intervenes to prevent you from driving each other completely insane, and provides useful common infrastructure. You need government-made playgrounds because you don’t have 2 acres with a public-park-sized play structure of your own. etc. More reason for me to be proud of being from Connecticut! An alternative hypothesis, a la Benjamin Friedman: in rich states the rich don’t see their interests in as stark opposition to those of the poor. In poorer states, they do. Purely speculative, but maybe it’s social capital that makes the difference. Ethically homogeneous small towns in poor states have lots of it. Families stay put, people are embedded in social networks including churches and (think they can) count on relatives, friends, neighbors and voluntary organizations to help them out. Relative will of course put you up, friends will help you get a job, the church will provide charity and support services, etc. They believe government is unnecessary and intrusive–and are taken be conservative anti-government rhetoric. In big cities, particularly on the coasts, people are mobile, not likely to be living surrounded by relatives or neighbors they can count on, bowling alone. Without social capital, detached from those informal support networks, they know they need formal institutions, government in particular, to supply services and safety nets. There’s some cause for optimism since even people who are embedded in these social networks are beginning to recognize that neighborly neighbor and voluntary organizations are just not up to the task. To summarize, it’s Catholics (and Jews). The wealthy more educated blue states are mostly correlated with more Catholics, who aren’t less religious (as red staters like to think), they just have a more orthodox tolerant take on Christianity drummed into them at church every Sunday. That results in more Catholics voting for a more compassionate, yes more communalistic, approach to society. The fact that that generates a much wealthier, educated, cultural and entrepreneurial society (with much better food) is a benefit that many of those educated Catholics understand. There is also a direct correlation to less divorce and less violence in the blue states, which is also a result of all those Sunday sermons at church. I think a lot of the conclusions drawn in the comments are not fully supported by the chart. They might be consistent with the chart but there is no way of knowing just from this chart. What jumped out at me was that the shift from poor to middle turned 19 states red, most east of the Mississippi, while the shift from middle to rich turned only 8 states red. Could not tell from an electoral college perspective what the effects were, although some of those 8 states had high numbers of electoral votes. All I can gather from this is that the Democrats won the nonpoor voters in only a few states and but for poor voters Bush had a landslide. Depressing.